Offering over 3500 full-size Woodcraft Patterns & Woodworking Project Plans! 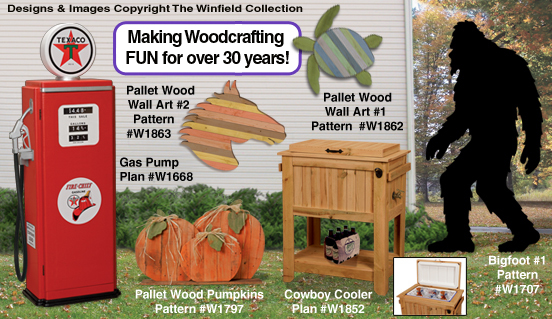 We're celebrating our 30th year of designing unique & original wood projects that "Make Woodcrafting Fun"... Christmas Woodcraft Patterns, Halloween Wood Projects, Yard Shadow Patterns, Indoor and Outdoor Furniture Wood Plans and more! Whatever the wood project, we've got the shop-tested patterns and plans that will simplify your woodworking with full-size traceable patterns, step-by-step instructions, assembly diagrams, wood layouts, material lists and…..technical support! Just call (800) 946-3435 if you ever have a question on any Winfield wood project! Why choose Winfield Collection Woodcraft Plans and Patterns?